As we approach the end of this 10 part series, hopefully you have picked up at least a couple of pointers and made a change or two. Small steps make a big change.. ever heard of the butterfly effect? Like the saying goes ‘A small mistake you commit can create blunders later’ – small improvements can make VAST changes! Got all that? 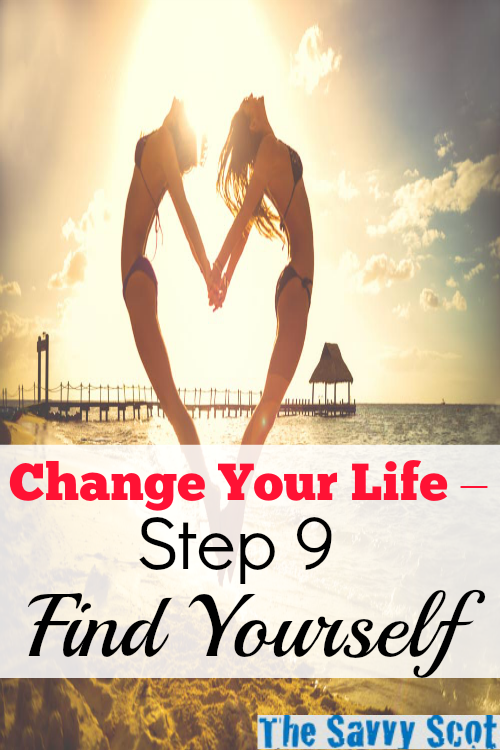 Good… It’s time to talk about finding yourself! First impressions of that phrase… a little bit of a cliche right? A stereotypical image of a lost soul trekking through a desolate jungle in search of finding their calling? Not quite! Have a breakdown – Why not avoid a breakdown in the first place? Watch A Clockwork Orange – This will result in finding yourself being pretty normal.. Therapy – After all of the above you will probably need it! Not really rating the above. Determine what your opinions are on everything. From politics to religion; if you don’t know about a topic – find out and decide which side of the fence you are on. Haven’t decided if there is a God or not? Do some research, formulate an opinion and act on it. Push yourself to your ABSOLUTE PHYSICAL LIMITS. From weightlifting to iron man competitions. Uphill sprinting, climbing, skiing; whatever it may be, push yourself to the edge and then some more. Keep going until you can’t take any more; then go some more anyway. You will learn so much about your personality and self that you never knew. With pushing yourself physically, comes pushing yourself mentally. Re-read Part 3 – Get Knowledge and this time actually do something about it. Your mind will be regenerated and refreshed. An active mind means a fuller life. Deal with the skeletons in your closet. You must deal with your past and accept what has happened. Cry, share, evaluate; do what you need to do. Stop blocking feelings and memories out – they are holding you back and preventing you from becoming the best that you can be. Remember, you can still change the future – but time is finite. Travel Travel and then Travel some more. As cliched as the traveling part is, it must be included. From nearby towns to countries afar – visit your locals and foreign counterparts. Interact with others and familiarise yourself with different ways of life. You will learn so much from different cultures and gain an insight into how and why different races interact and behave. Know your morals. Decide on your values and stick to them. Stand by them and defend them for these represent you as a person. Do not be two-sided or fake – there are an abundance of this sort already in the world. Forget Others Opinions. Stop living your life bothered about what other people think. Don’t let the opinions of others influence your decisions or prevent you from being the person you are meant to be. Those who do not accept you for who you are – are quite simply not worth having in your life. Identify the places that make you happiest – walks, parks, buildings, towns, countries, rivers – and visit them often. These will remind you of who you are and the journey you are on. Don’t let the corporate lifestyle and routine defile your true self. Wipe the slate clean. If you have already been through a lot in life, you may need to start from fresh. All the negative (and positive) opinions that you have on people, things or places may be contaminated. Learn to trust and learn to love again. Forgive and forget – move on and start again. Be prepared to let go of grudges and the hatred that is cutting you up inside. Your opinions were likely formed from a bad experience and it is unfair to stereotype on an unfortunate occasion. If for example, you are a smoker or heavy drinker / eater this may require some extensive rehab. Get clean and start again. I wonder how your outlook will change. If you died tomorrow what would your regret be? How can you make a change to act on that today? Good post as always Sir! What does it say when a certain number of those listed go back to illicit drugs?!? 😉 I would not mind backpacking through Europe…I know…wild & crazy! I don’t have many regrets if I die tomorrow. To find myself I don’t take many actions, but mostly don’t resist life. If you fight to stay in a job you don’t like, or in a situation you are unhappy with, you will not find yourself. Letting go helps me find the way. No regrets, other than not getting out of the 9-5 ‘grind’ earlier in life. Self-employment freed me up to explore opportunities. Hmmm what regrets would I have? Interestingly enough, the sermon at our church yesterday focused on regrets. I don’t know if I feel like focusing on them for a second day! With that being said, I wouldn’t have many regrets. Yes there are things I would do differently if I could “do it all again,” but overall I think it’s best not to dwell on those things. A wonderful series of posts! Are part 7 and 8 supposed to be separate links? Fixed 🙂 Glad you like them! Nice post. Thought provoking. Thanks!